It’s Five Minute Friday again! People all over the world blogging on the same topic on the same day for just five minutes and linking up at Lisa Jo’s place. Today’s topic: Change. Just the word makes me anxious. I have spent a lifetime fighting change. And, yet, here I am in a season of great change. And, just as I imagined, it hurts. And that, I suspect, is how it is supposed to work. When we have comfort, we are content with comfort. But throw a bit of unexpected and, let’s be honest, unwanted change our way and suddenly we are desperate for the changeless God. I do not like change. I do not like the uncertainty or the lost relationships or the dreams that die. I do not like the pain. But, I’m thankful. I’m grateful that my God does not change. My Jesus is still Savior. So, change? Bring it on. LOVE LOVE LOVE this —–>I long for the One who says, “I change not.” I too am one who fights change. I love the comfortable but He never leaves me there for long. So I am learning to lean during the change. Thanks so much for sharing friend! Blessings! Thank you so much for stopping by, Wendy. It’s so nice to know I’m not alone. Have a great weekend! Hey! found your blog from Lisa Jo’s…I am also one who hates change! It definately makes me nervous!! It is very comforting knowing that our God does not change..the same yesterday, today and forever! I just blogged about that the other day! So good to meet you!! So nice to meet you! Thank you for visiting and taking the time to comment. Change is hard for everyone, I guess!! 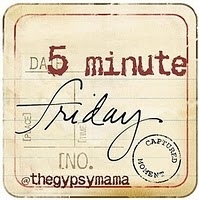 I found your blog through the five min friday linky! I am also one who hates change…i loathe it! at least ..like you said..we know our God never changes! I love that about Him, too! Thank you so much for visiting. I went to your blog and, wow, so glad I did. I left you a comment there. Blessings! Yes, He will, Colline. Yes, He will. Happy Friday! I recently heard a sermon where the pastor said that although we grow because of pain, it is the gift nobody wants. Can I hear an Amen? I have had a lot of change this past year, so I know exactly what you mean! The other problem with change is that it challenges fundamentally our ideas of who we are, and who we think we are, and who we truly are, can be very different. Hang in there!